™/®The Hyundai name, logos, product names, feature names, images and slogans are trademarks owned or licensed by Hyundai Auto Canada Corp. All other trademarks are the property of their respective owners. †Finance offers available O.A.C. 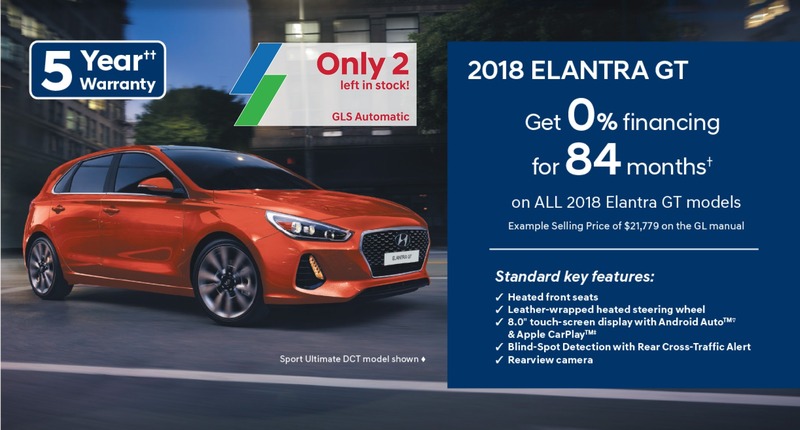 from Hyundai Financial Services based on new in-stock 2018 Elantra GT GL manual model with an annual finance rate of 0%. Weekly payments are $60 for 84 months. $0 down payment required. Trade-in value may be applied to down payment amount. Selling price is $21,779. Cost of borrowing is $0. Finance offers include Delivery and Destination charge of $1,705, levies and all applicable charges (excluding HST). Finance offers exclude registration, insurance, PPSA, license fees and dealer admin. fees of up to $499. Fees may vary by dealer. ◊Leasing offers available O.A.C. 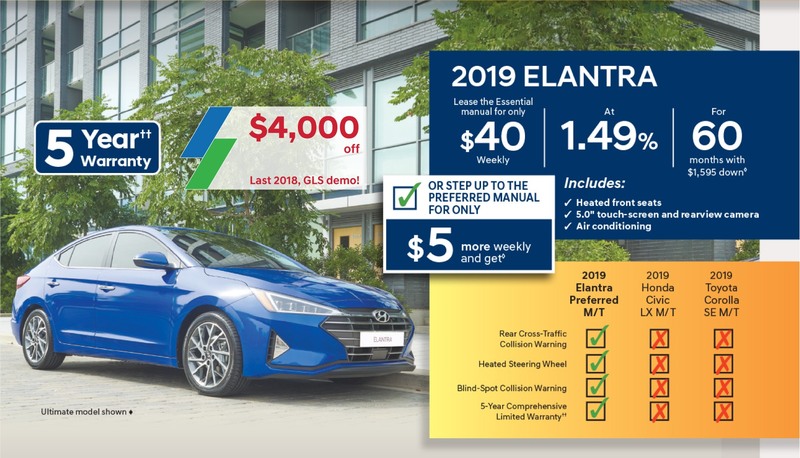 from Hyundai Financial Services based on a new 2019 Elantra Essential manual/2019 Elantra Preferred manual/2019 Kona 2.0L Essential FWD/2019 Kona 2.0L Preferred FWD/2019 Tucson 2.0L Essential FWD/2019 Tucson 2.0L Preferred FWD/2019 Santa Fe 2.4L Essential FWD/2019 Santa Fe 2.4L Essential AWD with SmartSenseTM Package/2019 Elantra Essential manual/2019 Veloster Manual with an annual lease rate of 1.49%/1.49%/2.49%/2.49%/ 1.99%/1.99%/2.49%/2.49%/0.9%/0.9%. Weekly lease payment of $40/$45/$55/$60/$65/$71/$75/$82/$51/$57 for a 60/60/60/60/48/48/60/60/48/48-month walk-away lease. Down payment of $1,595/$1,595/$1,995/$1,995/$2,945/$2,945/$2,995/$2,995/$0/$1,905 and first monthly payment required. Trade-in value may be applied to down payment amount. Total lease obligation is $12,083/$13,360/$16,386/$17,640/$16,536/$17,708/$22,532/$24,242/$10,539/$13,806. Lease offer includes Delivery and Destination charges of $1,705/$1,705/$1,805/$1,805/$1,805/ $1,805/$1,905/$1,905/$1,705/$1,705, levies and all applicable charges (excluding HST). Lease offer excludes registration, insurance, PPSA, license fees and dealer admin. fees of up to $499. Fees may vary by dealer. $0 security deposit on all models. 16,000 km allowance per year applies. Additional charge of $0.12/km. ΩPrice adjustments are calculated against the vehicle’s starting price. Price adjustments of $1,000 available on finance and cash purchase only of new in-stock 2018 Sonata models. Price adjustments applied before taxes. 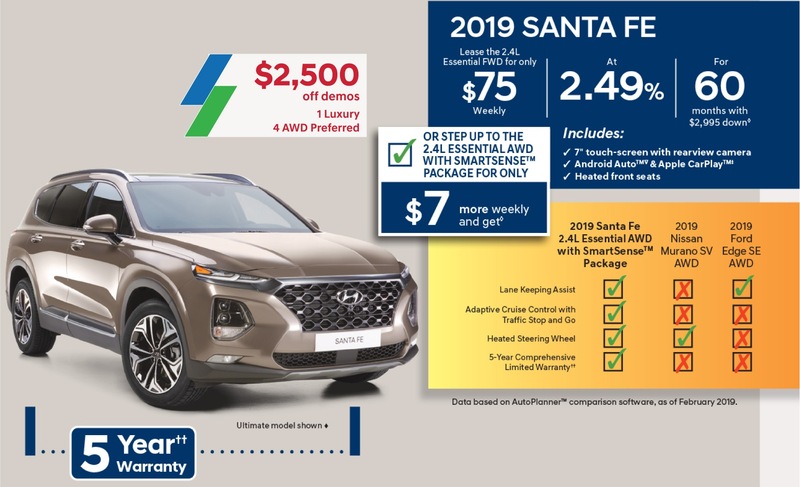 ♦Price of model shown: 2019 Tucson Ultimate AWD Aqua Blue/2019 Elantra Ultimate Intense Blue/2019 Kona 1.6T Ultimate Turbo AWD Tangerine Comet/2018 Elantra GT Sport Ultimate DCT Phoenix Orange/2019 Santa Fe 2.0T Ultimate Turbo AWD/2019 Veloster Turbo Tech DCT Tangerine Comet with Phantom Black Roof is $40,137/$29,437/$34,037/$32,487/$47,037/$32,687. Price includes Delivery and Destination charges of $1,805/$1,705/$1,805/$1,705/$1,905/$1,705, levies and all applicable charges (excluding HST). Prices exclude registration, insurance, PPSA, license fees and dealer admin. fees of $450. ♦†◊ΩOffers available for a limited time and subject to change or cancellation without notice. Vehicle colour is subject to availability. Delivery and Destination charge includes freight, P.D.I. and a full tank of gas. Dealer may sell for less. Inventory is limited, dealer order may be required. Offer cannot be combined or used in conjunction with any other available offers. Offer is non-transferable and cannot be assigned. No vehicle trade-in required. Visit www.hyundaicanada.com or see dealer for complete details. ∇Android Auto™ is compatible with Android phones running Android Lollipop or newer. Android Auto may not be available on all devices and is not available in all countries or regions. Additional apps may be required. Visit www.android.com for further details and any applicable limitations. Android and Android Auto are trademarks of Google Inc. ‡Apple CarPlay™ works with iPhone 5s, iPhone 5c, iPhone 5 and later models running the latest version of iOS 7 and above. CarPlay™ may not be available on all devices and may not be available in all countries or regions. Visit www.apple.com for further details and any applicable limitations. Apple, Apple CarPlay and iPod are trademarks of Apple Inc. ††Hyundai’s Comprehensive Limited Warranty coverage covers most vehicle components against defects in workmanship under normal use and maintenance conditions. ±Certain restrictions apply. Customers must present their proof of Military relationship and I.D. at time of purchase to receive special price discount off their purchase. Program subject to change or cancellation without notice. Visit www.hyundaicanada.com or see dealer for complete details. 1For further details, terms and conditions visit www.hyundaicanada.com/buyright or your local dealer. 2Vehicle exchange program is valid from August 1, 2018 as part of the Hyundai BuyRight™ promise. Hyundai Auto Canada Corp will provide a 5-day vehicle exchange to eligible customers who finance or purchase a new and unused Hyundai vehicle, includes vehicles registered as demos provided they have 100 km or less at the time of delivery. Exchange of a vehicle for another Hyundai brand vehicle must be made within five (5) business days after the delivery date with up to a maximum of 750 km on the odometer. Exchange is subject to customer finance approval, as applicable, and other applicable finance terms and conditions. The vehicle being returned must be damage-free, must not have been in an accident and installed vehicle accessories must be intact. Vehicle exchange must be made for a different model or trim. Customers cannot return their vehicle in order to purchase the same vehicle. Customers who cannot provide evidence of active and continuous insurance/registration during the time of ownership are not eligible. Vehicle exchange program is only applicable to the original purchaser of the vehicle and is non-transferable. Only one (1) vehicle can be returned per household through the program. Only one (1) return per eligible VIN. Subject to certain exceptions, the vehicle cannot have been modified in any way from original, including the addition of aftermarket accessories which were not previously installed at time of delivery. The vehicle must be returned with a full tank of gas to the dealership where customer originally took delivery. Customers will only qualify for retail incentives that were in place at the time of sale for their exchanged vehicle. Any incentive introduced after original delivery date shall not be applicable. New vehicle contract must be of the same sale type and term of returning vehicle. Any additional costs, fees or expenses that arise from the customer initiating the program shall be the responsibility of the customer and the dealer. Vehicle exchange program is subject to revision or cancellation at any time. 3The comparator data is provided under license from JATO Dynamics Limited. This information is provided for information purposes only for personal use and may not be used for any commercial purpose whatsoever without the prior written consent of JATO Dynamics Limited. Although the compare data is updated regularly, neither JATO Dynamics Limited nor Hyundai Auto Canada Corp. make any warranty or guarantee of any kind, express or implied, regarding the compare data, including without limitation any warranty regarding its currency, accuracy or completeness or any warranty of merchantability or fitness for particular purpose. All prices, specifications and equipment are subject to change without notice and should not be used or relied upon as a substitute for information that is available to you from your Hyundai dealer. Individual dealers are responsible for setting their own selling prices and may sell for less. Photographs may not reflect all features accurately. Pricing does not include any fees that may apply for vehicle colour choice. Vehicle colour choice may require certain options that may not be included in the options listed. Please contact your Hyundai dealers for complete details. Copyright © JATO Dynamics Limited, 1990–2018 . All Rights Reserved. JATO and Hyundai Auto Canada Corp. have been diligent in providing accurate and complete information; however, JATO Hyundai Auto Canada Corp. does not warrant the accuracy or completeness of the data. Please use care in your use of the information provided. 4Available on select models only. BlueLink® includes 5 years of service without charge. The BlueLink® service is available for new vehicle purchases and leases subject to the BlueLink® subscription terms and conditions. Only use BlueLink® and corresponding devices when safe to do so. Cellular and GPS coverage is required. Features, specifications, and fees may vary by models and are subject to change. For more on details and limitations, visit hyundaicanada.com or your authorized Hyundai dealer. 5All requests for a payment deferral must be made directly to the applicable loan provider. Subject to approval by loan provider at the time of request. Borrower must be in good standing at all times under the financing contract and must meet all other loan provider terms and conditions to be eligible for the payment vacation. Maximum eligible loan term is 96 months, but this may vary depending on loan provider’s requirements. Borrower will be eligible to defer the equivalent of one (1) monthly payment (defined as 1 monthly, 2 bi-weekly or 4 weekly payments) per twelve month period during the term of the loan, up to a maximum of five (5) deferrals over the entire term of the loan (subject to loan provider’s approval in each case). Interest will be charged on each deferred payment at the annual interest rate under the financing contract and such interest and each deferred payment must be paid over the term of the financing contract which will be extended accordingly. All other terms under the financing contract remain in effect and all other payments thereunder must be paid when due. Hyundai Auto Canada Corp has no control over availability, and eligibility requirements for, the payment vacation program as these are determined exclusively by the applicable loan provider. Hyundai Auto Canada Corp is not responsible for, has no obligations in respect of, and shall in no case be liable in the event that a loan provider cancels or amends the payment vacation program and/or if a lender determines that a borrower is not eligible to defer payments under the financing contract. Borrower is responsible for all additional interest and/or fees due to loan provider when requesting a payment deferral. Some specific restrictions may apply based on loan provider’s policies, including of the timing of any deferred payment and request therefor, and the remaining amount of loan. Each loan provider reserves the right to change the eligibility requirements or any other aspect of the payment vacation program or to cancel the program at any time in its sole and absolute discretion.